For years I was angry that the movie did win the Berlin Film Festival, but never found a German distributor. Now at last I caught up with it, and actually seem to understand what scared the suits off. That film is mayhem – it is early Greengrass, in full cinematographic spin, in a whirlwind around his protagonists, but not confined but too many millions of dollars of Hollywood money. He dives into groups of angry mobs, of confused policemen, of scared demonstrators, and lets us share the confusion and the anger and their scare. The film proceeds like a ticking clock, leading us one tick after tock nearer towards the inevitable catastrophe. This is all no-frills, I believe there was no music soundtrack at all in the film used to enhance atmosphere or suggest danger. The people we meet live in a constant life of frustration about the political reality and a constant need of improvisation for getting ahead with the normal life. When the Derry citizens assemble for another demonstration for civil rights and against what they see as the English occupation army, everything is normal in the erupting chaos. Only in the intercutting between the various fronts of police headquarters, police in the field and demonstrators do we realise that something goes more wrong than usual, and when the police starts shooting, it almost feels like the most natural thing. 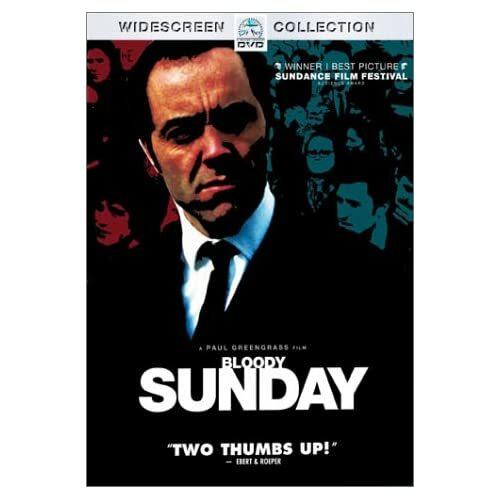 Is it a film that can only be understood if you are well aware of the historical sitiuation in Britain and Northern Ireland between the 1960s and 1980s? No, Greengrass is much too sophisticated a film maker, he tells you a story that could actually be set anywhere, it could also be a complete work of fiction. That it is true, and that it represents one the most stunning bits of unfairness and injustice in modern Western European history (including the government investigation that followed) only makes it even darker. But whoever sees the story unfold will understand how after the events of 1972, the IRA was flooded with angry young men and women convinced that their fight against the British was a just cause. Who could blame them?